Edited by Jenni at Monday Morning Coffee. Unlike the sweet jams and preserves, applesauce is something that I can without using any sugar. I love that it’s tart, just like the apples. I add lots of cinnamon, but you could leave it out if you don’t like it. Applesauce is a great food for babies, and my toddler loves it. Since I grew up on an apple orchard I love to have home-canned applesauce throughout the year that reminds me of home. 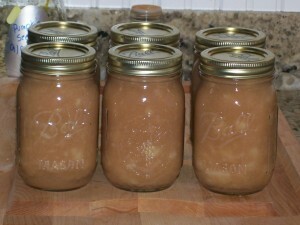 Applesauce is also a great way for novice canners to learn about food preservation! Sterilize jars by boiling them in a large pot of water for 10 minutes. Let them sit in the steaming water until you are ready to use them. Sterilize lids by placing them in a bowl and ladling boiling water from the pot over them. Make applesauce by peeling and cutting up apples, then cooking with cinnamon and just enough water or cider to keep it from scorching. Cook it and crush apples until it reaches your desired consistency, or for about 20-30 minutes. I don’t measure when making applesauce, I just make what I have. That’s why this is such a great recipe for beginning canners, since you don’t have to worry about adding pectin or testing for the “gel” point. You do kind of have to guess how many jars you’ll need, and I use the rule of thumb that one peck of apples makes about 3-4 pints of applesauce. Ladle into the sterilized jars leaving 1/4 inch head space (space at the top of the jar). Place caps on and screw on rings. If you have a half-full jar or more applesauce than jars, store it in the fridge and use it within a few days. Return the jars to the big pot of water, bring it to a boil and process for 15 minutes. Carefully lift the jars out of the water and place them on the kitchen towel or a cutting board to cool. Listen for the “plink!” as the jars seal. Feel free to ask any questions in the comments and I’ll be happy to answer them! Note: If you have never canned before, I highly recommend Joy of Cooking: All about Canning and Preserving and the Ball Blue Book of Preserving. These books will help you learn about safe canning practices and the equipment you will need. That is exactly how I make applesauce. 🙂 SO yummy. I can’t ever understand why people add sweetener. This turns out so perfectly. Do you have to peel the apples? I like to eat the peel and it contains nearly 2/3 of the fiber of the apple. Tia, you don’t have to peel the apples if you’re going to put them through a food mill or food processor. I don’t, so I peel them and eat most of the peels in the process! I am going to try putting the peels through my blender and then add it to the apples before I cook it. I want to keep the vitamins in it. We like chunky apple sauce. I left the peels on last time it was good but we didn’t like the bigger pieces of peel. Please be careful about putting the peels in. I’ve been canning for 40 years now and I still don’t feel comfortable diddlying with a recipe. There’s too high a chance of introducing something into the jar that won’t be canned in 15/20 minutes. I used to press my own cider (which always includes the peels during pressing) but you have to be very careful that none of the peels have come in contact with animals (e.coli) that have passed thru the orchard. Contact your agricultural extension agent to be absolutely sure you can include the peels before you can. Thank you Claire. I only did that once. I didn’t like trying to chew the peels up. Thank you also about the E.Coli warning too. We are buying organic apples from an orchard that hand picks and boxes everything. They are very careful. I can’t wait till our orchard starts producing, then I will have complete knowledge of how my fruit is grown. I have also been canning for over 40 years. Don’t you just love home canned foods? By coincidence, I did just this yesterday – same easy recipe too. I realized as I was peeling that I didn’t have enough jars so I ran to Wal Mart and found that Better Homes & Gardens has the cutest mason jars right now, cheap – they have sweet little red & white lids, and you can get matching labels for them. I had fun. Making this tonight! I got a screaming deal on organic apples, and made pie filling and working on this. Can’t wait to see how it turns out! Can the chunky applesauce be pressurized rather than hot water bath? If so for how long and at what pressure? Rita- Yes, you can use a pressure canner. Since models are different, please refer to the instruction booklet that came with yours, or consult The Ball Blue Book of Preserving. I don’t like to remove the peel. I have been just slicing the apples and cooking them to soft then using an immersion blender right in the pot to blend to the desired consistency. Yes, it does leave some bigger skin chunks, but a big slotted spoon can catch many of those. It takes 1/2 the time of hand peeling and is less mess than other mills or processor methods. Thank you for this recipe. I made my first batch of applesauce last weekend, and then made 2 batches and canned them today. It is so good- who needs sugar! Now my husband and I will be able to enjoy our apples all winter. This is how I make my applesauce. The recipe is short and direct to the point. I like the no specific amount. Especially the cinnamon. I don’t know if you could ever have enough cinnamon. Using a specific amount of cinnamon on apples is like saying use 1 cup of blueberries in a dozen muffins. It just does not cut it.